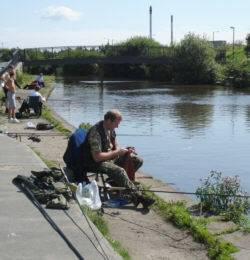 The Sankey Canal was originally known as the Sankey Brook Navigation and later as the St Helens Canal. It lays claim to being the first modern canal in England, or the first canal of the industrial age, and indeed it opened before its more famous neighbour, the Bridgewater Canal. To understand this claim, it is necessary to look at how the canal fits into the evolution of waterways. The first artificial waterways in England were constructed by the Romans, including the Foss Dyke between Lincoln and the Trent. In later centuries attempts were made to make rivers navigable by the use of weirs and locks, such as the Exeter Ship Canal, opened in 1566. By the 18th century, rivers such as the Mersey and Weaver were being navigated for some distance, and boats were even getting nearly a mile up the Sankey Brook to Sankey Bridges. At this time, there was a growing demand for coal by salt manufacturers on the Weaver and new industries in Liverpool, but the only means of transporting the abundant coal from around Warrington, Parr and Haydock was by horse or cart over poor roads. The idea of making the Sankey Brook navigable was put forward and gained support. In 1755 an Act of Parliament was passed to make the brook navigable as far as Broad Oak. So, officially, this was to be a traditional river navigation, but it is believed that the engineers knew that the brook was too shallow and twisting to be of practical use, so they constructed a completely separate canal alongside the brook. So, even though it was known as The Sankey Brook Navigation, it was, in practice, a discrete canal - the first to be built in England in modern times. It opened as far as the Old Double Lock by 1757 - several years before the first part of the Bridgewater Canal opened. Yet the Bridgewater is often proclaimed to be the first canal, since it was openly promoted as a canal rather than a river navigation! It is thought that the idea of building a separate canal was so radical that the Sankey's financial backers would be frightened away - hence the deception! The canal was constructed with broad locks to accommodate the traditional Mersey "flats" or sailing barges that already plied the Mersey. Because these had masts for their sails, all of the bridges on the canal were built as swing bridges. Later, when the railways were built, they also had to install swing bridges to cross the canal, with the exception of George Stephenson's Manchester to Liverpool railway - the world's first passenger railway - which crossed the canal by way of the Sankey Viaduct near Earlestown. The arches were 70 feet high, giving plenty of headroom for the boats' masts. The Old Double Lock was built to take the canal up to a level where further of collieries around Parr and Haydock and beyond could be served, with tram roads bringing coal from as far as Billinge. This was the first lock staircase to be constructed in England. A few years later, a second lock staircase, the New Double Lock, was constructed a mile further west on the canal. In the next 5 years, the company constructed two extensions beyond the Old Double Lock - a 1.5 miles branch going westwards to Gerard's Bridge, where there were collieries and a pottery, and the half mile Penny Bridge branch following Black Brook to the north. In 1762, a 1.5 mile extension was built at the southern end, from Sankey Bridges to a new lock onto the Mersey at Fidlers Ferry (also known as Fiddlers Ferry). This bypassed the narrow, winding course of the Sankey Brook below Sankey Bridges, that was only navigable at high tides. The Penny Bridge branch was extended to Stanley Colliery at Blackbrook Quay in 1770. Between 1770 and 1772 a further branch was constructed, south from the Gerard's Bridge branch, to Boardmans Bridge, south of the present St Helens railway station. This branch was reached by the construction of the New Double Lock and eventually came to be regarded as the "main line". In 1778, a further extension was added, going westwards alongside the Hardshaw Brook, then southwards to Ravenhead, to serve the Ravenhead Copper Works and the Crown Glass Works. The canal was proving very successful and profitable. In addition to sending out coal, it was used for bringing in raw materials for the various chemical works that grew up all along the route, including a concentration of glassworks in St Helens. 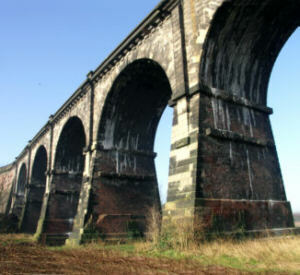 In 1830, the company faced competition when construction started on a railway between St Helens and Runcorn Gap. Its response was to go ahead with a further 3 mile extension from Fidlers Ferry to Widnes, which opened in 1833, five months after the railway. The canal extension, with its twin locks onto the Mersey, proved very successful, while the railway's business was disappointing. A toll-cutting battle almost left the railway bankrupt and it was obliged to merge with the canal in 1845 to form the St Helens Canal and Railway Company. The canal continued to carry more tonnage than the railway for many years, but the company began to invest its profits in constructing new railways rather than maintaining the canal. In 1864 the canal and railway became a part of the London and North Western Railway, who took its canal responsibilities more seriously. They found they needed to spend large amounts of money on dredging and remedial works. They later found that spillages from chemical works were polluting the canal and causing damage to lock gates. In the 1890s, substantial repairs were needed to counter the effects of mining subsidence - a problem for many canals in mining areas. The canal from St Helens to Ravenhead was infilled in 1898 as part of the extension of Pilkingtons' glass works. From 1900 traffic on the upper section of the canal dwindled and by the 1930s, the canal above Newton Common had been closed to navigation, with many of the bridges being replaced by fixed bridges. Sugar was still being carried to the Sankey Sugar Company in Earlestown until the 1950s but after that trade ceased the canal was officially abandoned in 1963. The Sankey Canal Restoration Society (SCARS) was formed in 1985 to try to prevent further deterioration and begin restoration. They have put forward a proposal to construct a new 4 mile link to the Leigh Branch of the Leeds and Liverpool Canal, which would connect the Sankey to the main canal system for the first time! Work by volunteers and local councils has seen some sections of canal restored to form an attractive linear route, as can be seen in this site's Virtual Journey, which also shows some of the obstacles to be overcome in order to restore the canal fully. The Sankey Canal celebrated its 250th anniversary in 2007! More information about the canal can be found on the website of the Sankey Canal Restoration Society.